At Hellsgate Maximum Security Prison, Foot Soldiers spring a gang of 5 notorious cons: Brian “Bulldog” Brooks, Frankie Grimes, Victor Schmitz, Dax “Drive-By” Delany, and Leroy Flack. The Foot leave them a case of Kraang weapons and a meeting point. If they can make it to the spot by 9pm, the Foot will remove their GPS tags and allow them to join their ranks. 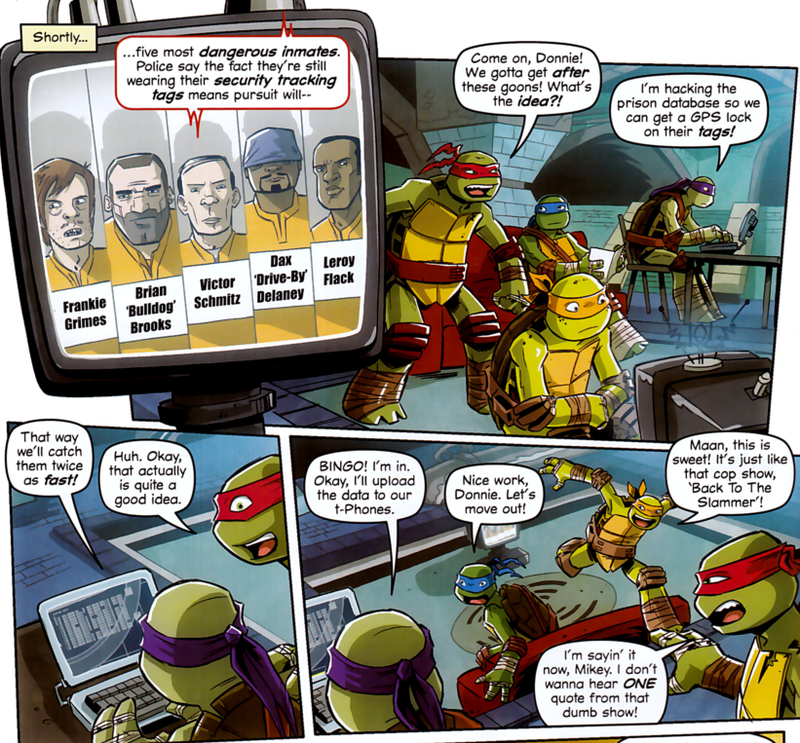 Down in the lair, the Turtles hear the news about the escaped cons and Don hacks into the police GPS tracking system. 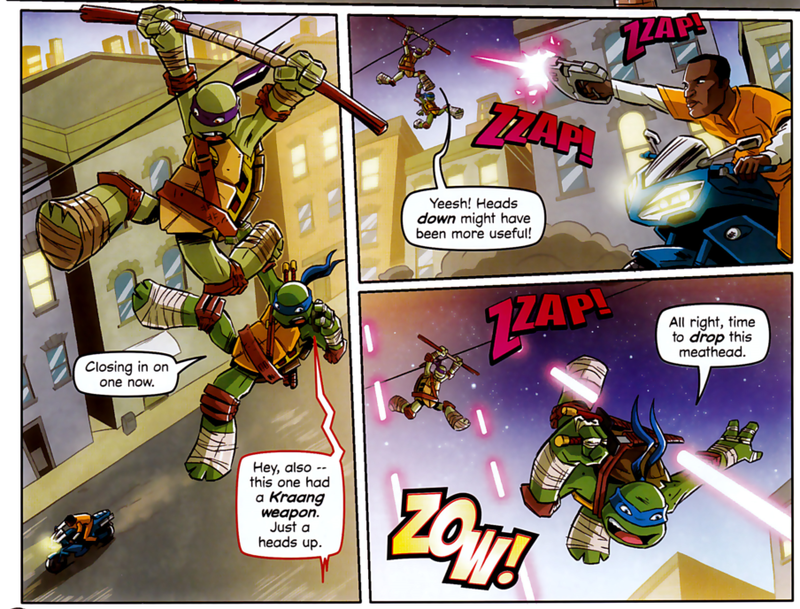 They break up into two teams (Leo/Don and Raph/Mike) and head out after the thugs. Raph and Mikey encounter Grimes first. Armed with a Kraang freeze ray, he tries to zap them with it but can’t get it to work. Inevitably, he zaps himself and the Turtles leave him to the police. Leo and Don take on Flack, who has stolen a motorcycle and figured out how to use his energy blaster. Leo throws his katana into the wheel of the motorcycle, sending Flack crashing in time for the police to pick him up. Meanwhile, Rahzar and Fishface wait at the meeting point for the initiates. They grow paranoid, fearing that the Shredder might be trying to replace them for all their recent failures. As for the Turtles, Raph and Mikey are pursuing Schmitz, who has stolen a cab. They jump on the roof and the distraction causes Schmitz to drive the vehicle into a sharp sheet metal fence. The fence slices the cab in two right down the middle and the Turtles tie Schmitz up. Bulldog and Drive-By make it to the meeting point in time, but before Rahzar can remove their tags, the Turtles arrive in full force. A fight breaks out and Bulldog and Drive-By prove formidable with their Kraang tech. Suddenly, Rahzar and Fishface bonk them over the head and help the Turtles tie them up. They explain that destroying the Turtles is THEIR job, but before they can go at it, the police show up and both sides scram. 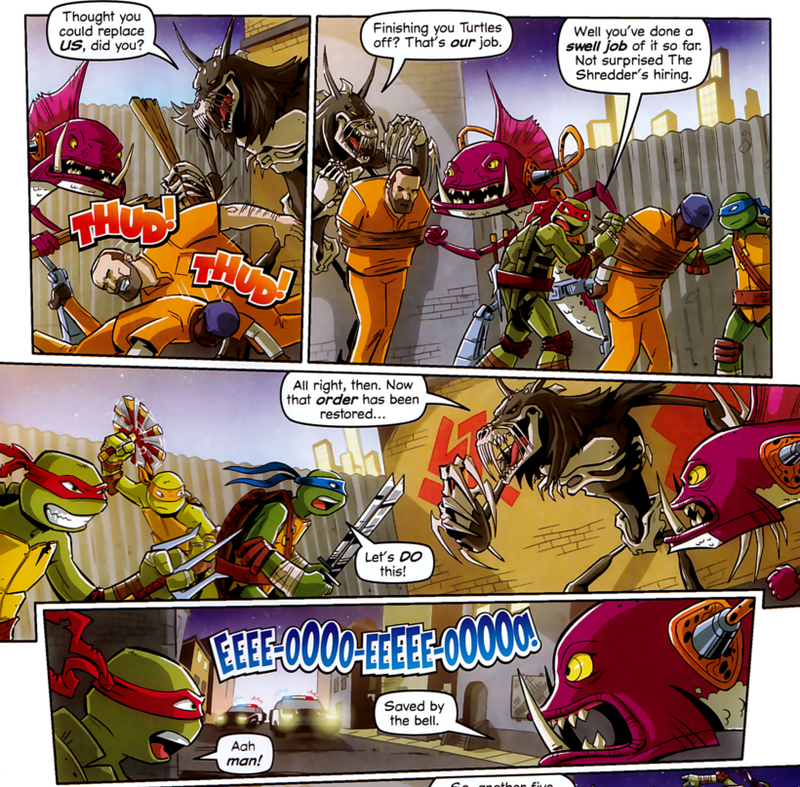 *This story is continued from TMNT Magazine (Panini) #18. 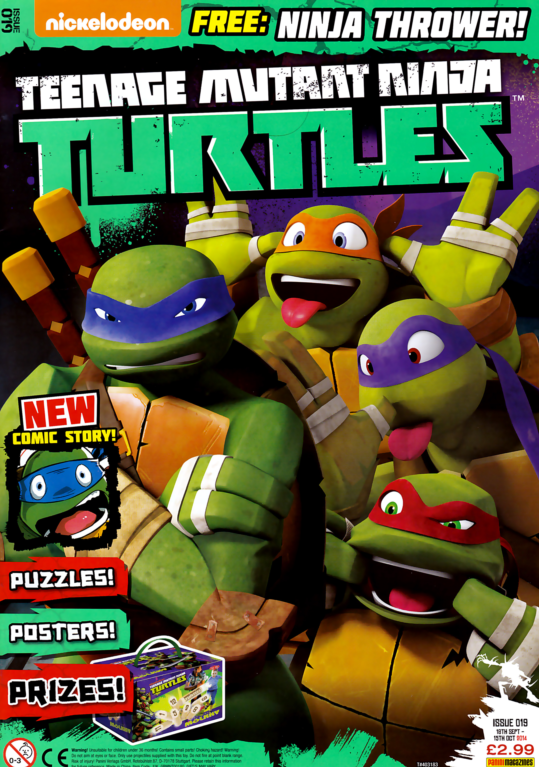 The story continues in TMNT Magazine (Panini) #20. It’s amazing how much story Caruana can pack into 12 pages. The pace is hectic, but not quite rushed. Each escapee gets their moment to shine and there’s even time for the Foot mutants to trade paranoid jabs at one another. It’s an impressive bit of economic scripting. The dialogue is perhaps a bit pun-heavy, but that’s pretty typical of these one-shot comedy relief strips. Mikey spends the issue quoting a TV show called “Back to the Slammer” (presumably a parody of “Cops” if that show even still exists) and his antics can get a little irritating. But it’s Mikey; his antics are almost ALWAYS irritating. I liked seeing Rahzar and Fishface trade barbs. The cartoon has sort of forgotten about their dynamic ever since the cast became bloated with evil mutants and this issue was a fun reminder of their earlier relationship. I guess if there’s one thing these IDW and Panini comics are good for, it’s going back to ideas that the Nick cartoon left behind seasons ago. Bob Molesworth provides some serviceable art and Cardy's colo(u)rs are as awesome as always. Once again, I’d really recommend picking up the trade paperback collection of Panini TMNT comics (you have to get it from Amazon UK). If you haven’t been digging IDW’s cartoon-based comics, then Panini’s stuff might be more up your alley. Frankly, I'm more impressed with how a kids comic includes a prison called HELLsgate.